Person Responsible: T. Naish et al. 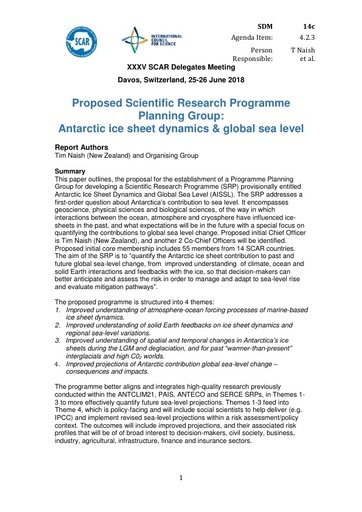 This paper outlines, the proposal for the establishment of a Programme Planning Group for developing a Scientific Research Programme (SRP) provisionally entitled Antarctic Ice Sheet Dynamics and Global Sea Level (AISSL). The SRP addresses a first-order question about Antarctica’s contribution to sea level. It encompasses geoscience, physical sciences and biological sciences, of the way in which interactions between the ocean, atmosphere and cryosphere have influenced ice-sheets in the past, and what expectations will be in the future with a special focus on quantifying the contributions to global sea level change. Proposed initial Chief Officer is Tim Naish (New Zealand), and another 2 Co-Chief Officers will be identified. Proposed initial core membership includes 55 members from 14 SCAR countries. The aim of the SRP is to “quantify the Antarctic ice sheet contribution to past and future global sea-level change, from improved understanding of climate, ocean and solid Earth interactions and feedbacks with the ice, so that decision-makers can better anticipate and assess the risk in order to manage and adapt to sea-level rise and evaluate mitigation pathways”. 1. Improved understanding of atmosphere-ocean forcing processes of marine-based ice sheet dynamics. 2. Improved understanding of solid Earth feedbacks on ice sheet dynamics and regional sea-level variations. 3. Improved understanding of spatial and temporal changes in Antarctica’s ice sheets during the LGMand deglaciation, and for past “warmer-than-present” interglacials and high C02 worlds. 4. Improved projections of Antarctic contribution global sea-level change-consequences and impacts. The programme better aligns and integrates high-quality research previously conducted within the ANTCLIM21, PAIS, ANTECO and SERCE SRPs, in Themes 1-3 to more effectively quantify future sea-level projections. Themes 1-3 feed into Theme 4, which is policy-facing and will include social scientists to help deliver (e.g.IPCC) and implement revised sea-level projections within a risk assessment/policy context. The outcomes will include improved projections, and their associated risk profiles that will be of of broad interest to decision-makers, civil society, business, industry, agricultural, infrastructure, finance and insurance sectors. Delegates to consider the proposal and decide whether to approve establishment of the Programme Planning Group.